The best natural mosquito repellent on the market and the Ultimate alternative to DEET, offering long-lasting protection for up to 10 hours! This plant-based formulation is DEET-Free and alcohol free, so it is unlikely to irritate skin and can be used on children from 6 months +. It is made using the natural repellent Citriodiol™ (Oil of Lemon Eucalyptus) which has a fresh and pleasant smell. Applied to exposed areas of skin, it effectively repels mosquitoes, midges, ticks, sand flies, black flies and stable flies. This is the perfect natural repellent for health conscious mums to take on family holidays. For more information on Citriodiol™ see our FAQs. Trek Natural provides up to 10 hours protection. The length of protection provided is dependant on a variety of factors including perspiration and activity. What are DEET-Free repellents made of? Pyramid DEET-Free repellents are made using Saltidin® or Citriodiol®, both are approved for use as insect repellents under the Biocidal Products Regulations (528/2012). Trek Sensitive and Trek Midge & Tick are made using the repellent Saltidin®, otherwise known as Picaridin or Icaridin. Saltidin® is recommended by the World Health Organisation as an effective repellent, comparable to DEET. It has been used as an insect repellent since 1998. Saltidin® is suitable for use on children over 2 years. These two Pyramid deet free insect repellents are made using our unique time-release technology; the repellent is micro-encapsulated or encased in a shell, giving a sustained release of repellent for up to 12 hours protection. Our plant-based natural mosquito repellent is made using the active repellent Citriodiol®. Citriodiol is the trade name for p-menthane 3,8 diol oil (PMD), or Oil of Lemon Eucalyptus. Trek Natural does not contain any alcohol which could irritate skin. It is suitable for children 6 months+. What Insects does Citriodiol® provide protection against? 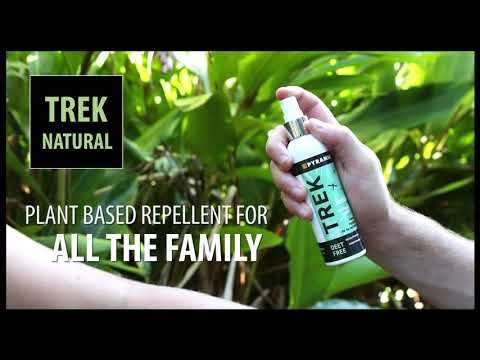 Is Trek Natural insect repellent really naturally sourced? Trek Natural mosquito repellent is made using the active ingredient that comes directly from Eucalyptus citriodora oil, produced through a natural and sustainable process of steam distillation. The oil is turned into p-menthane-3,8-diol, which mimics the natural process which occurs in Eucalyptus trees. Citriodiol® is the only natural ingredient that is approved for use as an insect repellent. Eucalyptus trees are a natural and renewable resource, and the Citriodiol® we use to create our natural insect repellent contains about 64% p-menthane-3,8-diol. Adventure travel is a huge privilege. Staywell take pride in supplying high quality travel products from one avid traveller to another. Travel well, stay well. An online travel shop supplying the best products that we have personally selected throughout Europe. A huge range of travel products such as water purification systems, mosquito nets, first aid kits and much more! Wherever you are travelling to in the world feel secure knowing you have Staywelltravel behind you. Our products can be found at Amazon.co.uk being sold by a variety of sellers. If you can't find what you are looking for please contact us and we will point you in the right direction! As Seen in Active Traveller Magazine, read the 5 star review here. Ideal for extreme tropical conditions and family travel, Trek Ultra is a great alternative to our now withdrawn Trek 100 mosquito repellent. Read more about the reasons behind the removal of Trek 100 here. To make sure we still offer the best repellents on the market, our scientists have developed the technically advanced mosquito repellent Trek Ultra, to give you exactly the same long lasting protection as Trek 100 but with a third of the DEET! How does Trek Ultra work? It contains micro-encapsulated DEET which is released slowly over the period of wear, which reduces the amount that needs to be applied to the skin. One application continues to be effective for up to 12 hours and it can be used on children from age 2+. Due to the micro-encapsulation technology this mosquito repellent is also more durable in wear and is sweat & splash resistant. Trek Sensitive, now with an even better product formulation. This DEET-free insect repellent is clinically proven to be as effective as equivalent 50% DEET products. It is an excellent broad spectrum repellent, ideal for providing all day protection from insect bites. Based on the latest Saltidin® technology, this gentle repellent is suitable for use by those with sensitive skin, children over two years and pregnant women. Apply once for all day, 12 hour protection! Made with advanced time-release technology, the Saltidin® is released slowly during the period of wear giving longer lasting protection than other repellents on the market. This insect repellent is sweat & splash resistant, non-greasy, and has a pleasant smell, meaning it is perfect for children and all the family. Trek Sensitive is also available in a wipe format. Please click here for more information.